The time was when people would fly into Phuket, spend a few days on the beach, and fly out. These days, people want more. More adventure, more privacy, more luxury, etc. Fortunately, the area around Phuket is well-endowed with hidden bays and natural scenery. There are now accommodations of all types and other tourist services available all around the mainland surrounding Phuket. 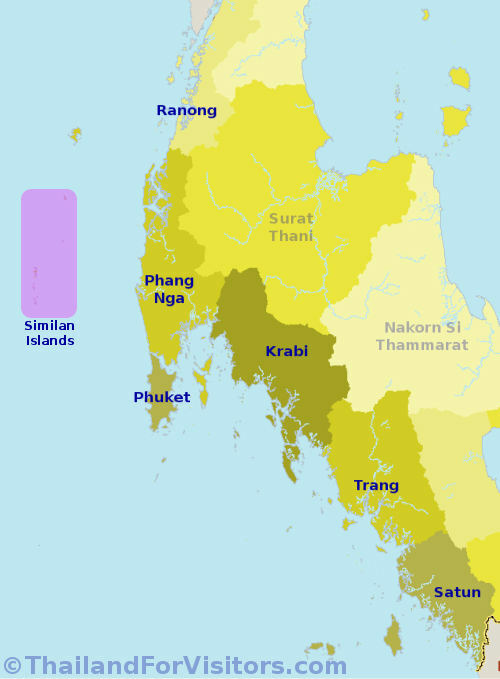 Phuket was probably the first truly international resort in Thailand. This island, the largest in Thailand, has such a varied scenery that there is something for just about everyone. This pair of islands roughly half-way between Phuket and Krabi have become an extremely popular destination -- a little too popular for some as the islands are frequently at the center of controversy over environmental degradation. The attraction for most is the extremely clear water which makes the wonders of a coral reef accessible to even non-divers. Ever since featuring prominently in the James Bond film, The Man With the Golden Gun, the fantastical seascape of Phang Nga bay has been a major tourist draw. It used to be that you visited this natural wonder on a day trip from Phuket, but now an increasing number of hotel options has resulted in more people staying in Phang Nga town itself. The provincial capital of Krabi is a picturesque small town, but is mainly just a hub for onward travel to and from the Phi-Phi and Lanta Islands or the beaches of the Krabi coast. The two large Lanta islands are the main tourist destinations in Krabi province. The islands feature many secluded bays, occupied by resorts popular with honeymooners.